Perhaps up there with the BEET TACO, no other special taco gets as much love as our Brisket Taco. 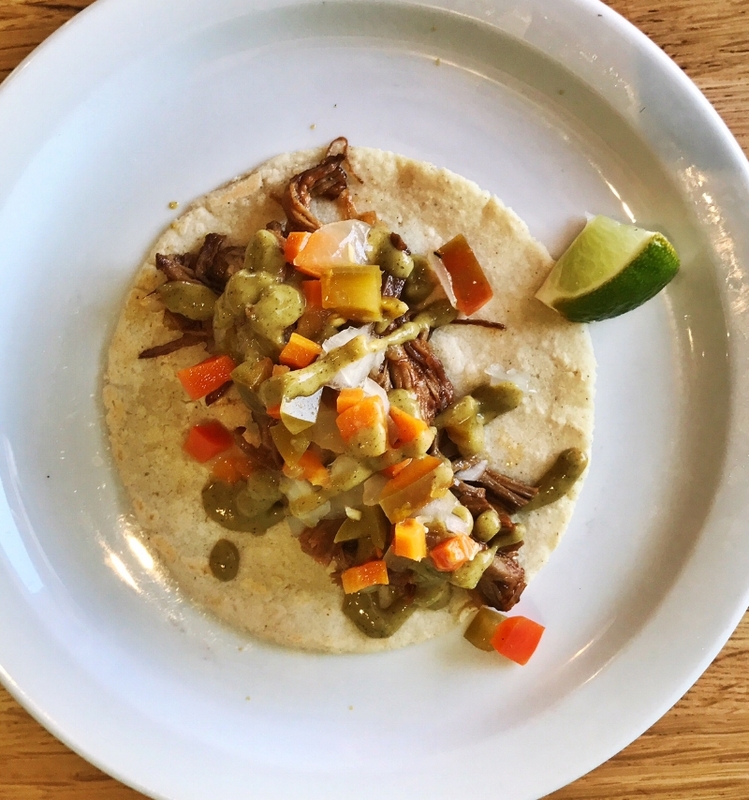 The Brisket Taco is featured this month at both locations as our TACO of the MONTH (pro tip, the Brisket Torta is an amazing sandwich but not always listed, wink wink). The Brisket taco was born from a need to have something Texan-y on the menu and was inspired by a trip to Austin's famous Franklin BBQ. I'm not a diehard bbq fan like some people, but here is what I do like about bbq - the intense salt and smoke flavor cut with the sour pickles, onions and, sometimes yes and sometimes no, some sauce to bring it all together. Returning from Austin, inspired by Franklin and wanting to do something with brisket, I was faced with a bit of a conundrum - we don't have a smoker. But I dove in and found a recipe that borrowed some smoky flavor from chipotles (which isn't just a burrito restaurant). For me the key to our brisket is two-fold. First, we braise the brisket until tender, then use the braising liquid to saute up the brisket when ordered - EXTRA UMAMI! Second, the pickled chiles, carrots and chopped onion, help replicate that Texas bbq flavor.